It's not uncommon to see people using plastic to pay for purchases. Although most people are familiar with those little cards many consumers carry in their wallets, they may not realize that there is a difference between credit cards and charge cards. Let's compare the two types of plastic. Both credit cards and charge cards have a spending limit. However, with a charge card, you have to pay the balance in full each month. You cannot roll over the balance from one billing cycle to the next, so charge cards do not have annual percentage rates (APRs). Credit cards allow you to carry a balance from month to month. The billing statement requires you to make at least a minimum payment, which usually covers only the interest. Interest charges can add significantly to your monthly bill. That's why it's important to shop around for the best credit card rates. At present, charge cards still make up a small share of the vast market for consumer card activity. But direct-mail offers for charge cards have been growing fast. They remained for years at 2 percent of all credit-card offers, but in around 2007 they started becoming commonplace, and now they have quadrupled to 8 percent of all offers as of October 2009, according to market-research firm Synovate. Whether you get a charge card or credit card, it's important to read through the terms. Both types of cards may have annual fees, transaction fees, late fees, or over-the-limit fees. Both types of cards also may have rewards programs. The terms should also give contact information for the card issuer. 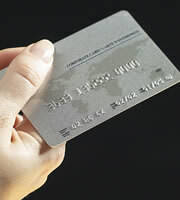 Credit card terms also discuss the APR, how finance charges are calculated, and the minimum finance charge. Using a charge card may help you avoid getting caught up in a debt trap. Credit card debt can easily spiral out of control when you only make the minimum monthly payments. Many people start off with good intentions to pay off their credit card each month but slip into the habit of rolling over a balance. A charge card doesn't allow you to roll over the balance, so you are more likely to only charge what you know you can afford to pay back at the end of the month. 0 Responses to "Credit Cards vs. Charge Cards"